It’s a jolly good day in Melbourne’s central business district, there’s not a cloud in sight, the sun is beating down and things are looking promising for a day at the tennis courts. It’s no later than 9 a.m. and as I board a private water taxi from my hotel towards the tennis complex, the boat steward offers me a glass of 2016 Jacob’s Creek Reserve Chardonnay Pinot Noir. I wonder if I should indulge in sparkling wine at this hour or more appropriately partake of the city’s world-famous coffee culture. I choose the former, consoling myself that I am, after all, about to spend a day at the Rod Laver Arena, watching the world’s tennis greats play at the Australian Open championship. On that indulgent note, I disembark, and walk around Melbourne Park, the city’s sports hub and venue for this sporting event. It becomes increasingly clear to me that people take sports very seriously here. Residents and tourists are out in large numbers, heading to the multiple tennis courts in different directions. A big draw, of course, is Swiss tennis legend Roger Federer’s match that is scheduled to commence at noon, at the Centre Court. To continue my indulgence, I am ushered to the private Jacob’s Creek Lounge, attached to the arena, where select guests can enjoy a wine-meets-sports experience. 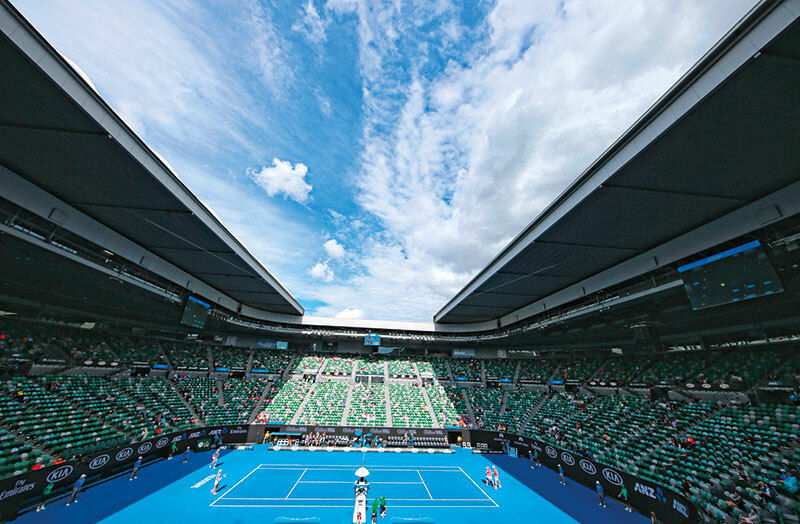 The heritage Australian winemaker is the tournament’s principal partner, explaining why the glitzy tennis event is dotted with myriad wine counters and pop-up bars. As we watch Serena Williams on big screens, a multi-course gourmet lunch is served up, with Richard Doumani, the swashbuckling brand ambassador of Jacob’s Creek, keeping me company. Doumani pours me copious quantities of the 2016 Jacob’s Creek Reserve Adelaide Hills Chardonnay and the prized 2012 Jacob’s Creek Centenary Hill Shiraz, Barossa and lavishes me with restaurant and bar recommendations. A few glasses of wine and an espresso later, I settle into my ringside seat, to watch Federer play. This truly is the only way to experience the Melbourne sports vibe. The positive energy in the stadium is palpable and the cocktails and bar snacks flow endlessly. Later that afternoon, I decide to explore the famous ‘hipster’ alleys known for their quirky graffiti, arty sidewalk cafes and an unmistakable joie de vivre. I opt for a flat white at Brunetti Cafe Melbourne, a historic, Italian-style eatery and patisserie, with Alison Viegas, a Melburnian sports enthusiast and trendy local. With great zeal, she explains Melbourne’s busy annual sports calendar to me. “There is something in here for everyone,” she says. “Formula One fans can head over to the Melbourne Grand Prix Circuit at Albert Park, while racing buffs can check out the Cadel Evans Great Ocean Road Race, which happens every year in January. The iconic and historic Spring Racing Carnival is a series of thoroughbred horse races, which is an extremely fashionable affair.” Most venues lend themselves perfectly to enjoying a day of live sports, with open-air arenas, beer gardens, screens, pop-up restaurants et al. Viegas recommends a bar or pub crawl through Melbourne’s neighbourhoods, during important sporting events. “Locals feel strongly about sports and you can actually feel the pulse of the city at a pub, during a cricket, football or tennis match,” she adds. Later that evening, I catch up with Doumani once again, to check out Sezar, a trendy Armenian eatery, tucked away in a nondescript alleyway. This is just one of the many international cuisines that find representation in Melbourne, touted by many as the southern hemisphere’s food capital. It specialises in fresh, locally sourced ingredients, served in tapas-style sharing portions, paired with Australian wines. The next day, I decide to turn my attention towards cricket. And what better place to start the morning than with a visit to the National Sports Museum, located at the legendary Melbourne Cricket Ground (MCG). I spend a few hours browsing through the Sport Australia Hall of Fame, the Australian Cricket Hall of Fame and the Melbourne Cricket Club Museum, making a brief pit stop to see the Shane Warne 3D hologram at Backyard to Baggy Green. The highlight of this is, of course, the actual tour of the MCG, where you visit the stands, the players’ changing rooms, the library dating back to 1873 and even pose in front of the historic portrait of Sir Donald Bradman and Sachin Tendulkar. With cricket, tennis and the local coffee culture ticked off my list, I decide to spend my last evening in the trendy waterfront suburb of St Kilda. I make a stop at the historic St Kilda Sports Club, founded in 1865, which is where several sports like bowling, cricket, darts and even the French game of pétanque are played even today. The famous St Kilda lawn bowls is a must-do (barefoot, of course), if you’re in the neighbourhood. The waterfront promenade at the St Kilda beach is a trendy place to shop, have a drink, go for a run or simply people spot. The open-air terrace at Captain Baxter, in the building of St Kilda Sea Baths, is perfect for bubbly sundowners. After sunset, I move indoors for a copious meal, inspired by Asian street-food favourites. If you’re a sports fanatic, Melbourne is indeed a great place to visit. Ensure that your travel dates coincide with one of the ongoing sporting events in the city. Experience the city’s food, beverage and culture scene, through the prism of sports, and tick it off your bucket list.